Paranormal research can trigger many fears and phobias. In a stressful situation, otherwise benign concerns can surge up out of nowhere and become issues. Never brush this off, saying that fears are “made up” or evidence of weakness. Likewise, don’t lump all ghost hunting fears into one category. Sure, some people are afraid of ghosts. They usually know about that, even before they go on a ghost hunt. But, people with other, more subtle fears may not expect to be scared — or even terrified — during a routine ghost hunt. Remember, even Brian Harnois (an early cast member of Ghost Hunters) had been an unshakable investigator. His famous “Dude, Run!” moment was unusual. The following are several phobias related to ghosts, ghost hunting, and the kinds of locations where we usually investigate. Phasmophobia and spectrophobia are the fear of ghosts or spectres. Many people, especially beginners, are somewhat afraid of ghosts. Necrophobia is a fear of the dead and dead things. That’s not just about zombies or vampires. A ghoulish apparition can trigger paralyzing fear if someone is already worried about the dead. Scotophobia and myctophobia mean the person is afraid of the dark. Achluophobia is another word for that fear. Tip: Since darkness play such a big part in ghost hunting, a team member with those issues may do better in a lit area. Assign him or her a role in monitoring equipment via a laptop in a lighted room, hallway, or vehicle. Lygophobia is sometimes described as a fear of darkness, but it’s more correctly a fear of twilight. According to folklore, the “between times” include twilight, dusk, midnight, and dawn. That’s when some entities may be more active. Eosophobia is the fear of dawn or dusk. Nyctophobia is the fear of the dark or fear of nighttime darkness. Noctophobia is simply a fear of the night. Many haunted sites are active during daytime hours. Someone with severe nyctophobia can still participate in ghost research during the day. Domatophobia, eicophobia, ecophobia and oikophobia relate to a fear of houses and/or the objects in them. Is a team member uncomfortable in other people’s homes? Perhaps he (or she) should skip those investigations, and focus on outdoor haunts and public buildings. Nyctohylophobia describes a fear of dark, wooded areas. That can be a problem at some haunted battlefields and rural homes. Also, many cemeteries are enclosed by heavily wooded areas on three sides. When I’ve witnessed this issue, the fearful researcher couldn’t explain what was bothering her. She’d never experienced it before. Taphephobia and taphophobia include the fear of being buried alive, as well as a fear of cemeteries. In many cases, the person can be desensitized over several visits, so this won’t be an issue during investigations. Coimetrophobia is another term if someone is afraid of cemeteries. It’s far more common than people may realize. 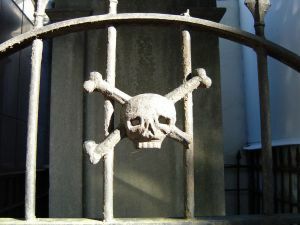 Frequently, the phobia is very specific, such as when someone is afraid of stepping on a grave. Other phobias can trigger anxiety among investigators. Keep them in mind if a team member seems uncomfortable on certain kinds of research. Chat with that person. Find out exactly what bothers him or her. Phobic researchers should avoid locations where there anxieties might distract the team. That doesn’t mean they have to give up ghost hunting. If you’re the person experiencing anxiety, remember: others may have the same (or related) fears. Understanding exactly what worries you can help. This is fascinating. Ghost hunting is something I’ve always wanted to try with a group of friends. It’s good to know that you need to keep these phobias in mind when choosing a place to hunt. I imagine that this list could actually be helpful for anyone who owns a haunted house. It would probably give it a more realistic feel and make it scarier. Yes, perhaps you should coordinate this with Taylor. She’s posted similar comments, so you’re probably on the same wavelength with your shared interests. Previous Previous post: Has a ghost ever killed anyone? Next Next post: How can I get over a fear of haunted houses?